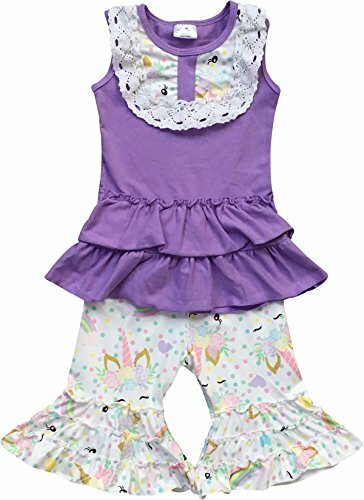 Kids Sleeveless Lace Ruffles Floral Easter Pants Set for girls is cute for Christmas, Holiday and Summer Days. Perfect for daily wear, casual, photo shoot, and other special occasions. 2 Pieces Set: Sleeveless Top, Ruffles Pant. Sleeveless Lace Ruffles Top, Unicorn Rainbow Pant. Soft comfy materials; lightweights materials. Perfect for school, playwear, daily wear, party outfits, events, and any occasions.